This distinctive hand-made planter is fabricated from thick metal, completely seal welded, and then ground and polished smooth. It makes an ideal piece to accent your patio, deck, or other outdoor location. The item shown features a durable powder coat finish that is designed for long-lasting beauty. Other finishes are also available. 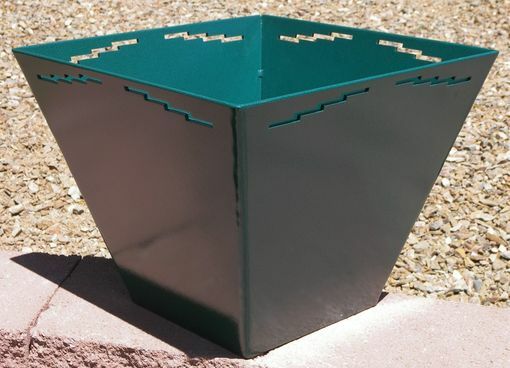 These planters are individually fabricated to order in a variety of sizes, styles, and colors. They can be made to hold anything from small plants to large trees. Just let me know the approximate size you want. I'll get you a price and craft one just for you!